We’re proud to share great news with you! 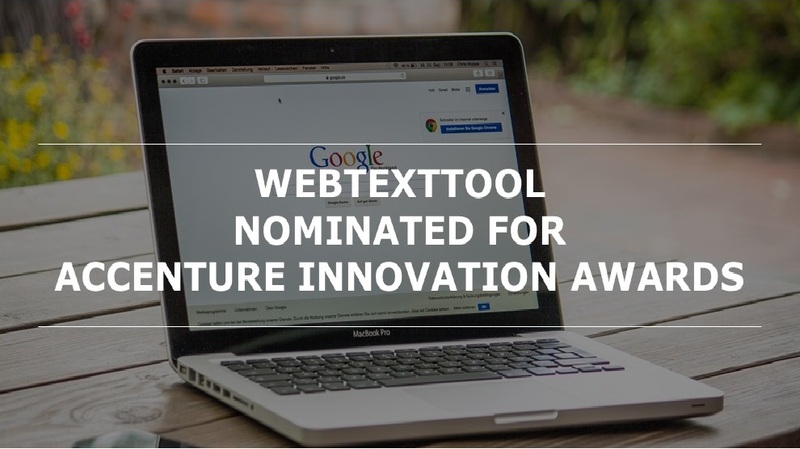 Webtexttool has been nominated for the Accenture Innovation Awards in the category Intelligent Enterprise. And you can help us win this public award by voting online! To win the award webtexttool has to collect public votes by social voting. The idea is simple: the concept that collects the most social votes will win the public prize. You can vote online per social channel Twitter, Facebook and/or Linkedin. Every voting term covers two weeks. That means that you can vote for webtexttool from 5 July until 18 July. Go to the Accenture Innovation Awards website and give us your vote! The Accenture Innovation Awards is a yearly event organized by Accenture and rewards the most innovative products, services and concepts within the Netherlands. Startups with exceptional performance in innovation or sustainability, which are younger than three years can compete in eleven categories in order to win the best innovation award, the most sustainable innovation award and the public award.